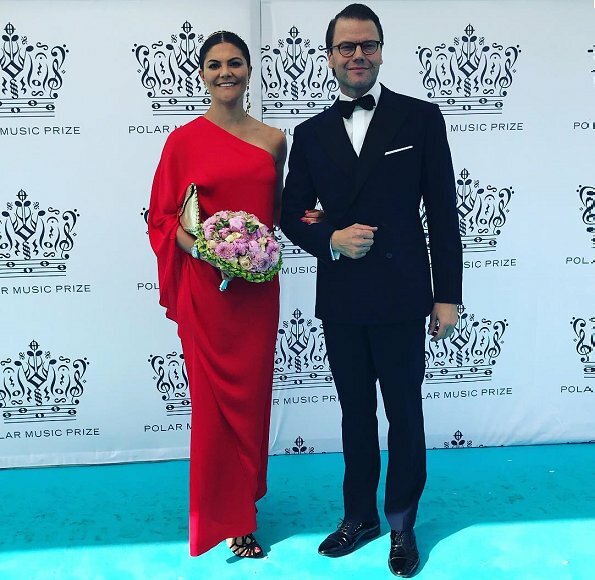 On June 14, 2018, King Carl XVI Gustaf , Queen Silvia, Crown Princess Victoria, Prince Daniel, Prince Carl Philip, Princess Sofia and Princess Madeleine attended 2018 Polar Music Prize held at Grand Hotel in Stockholm. 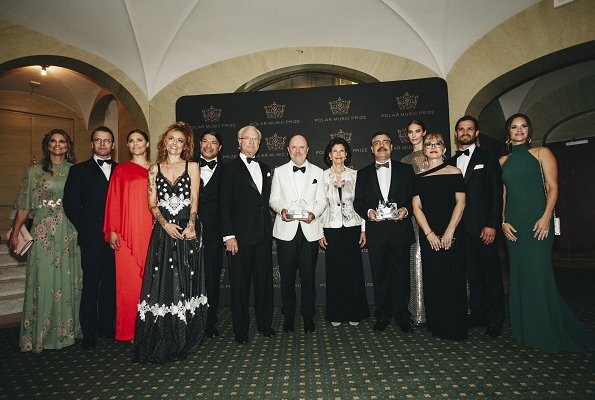 The Polar Music Prize is a Swedish international award founded in 1989 by Stig Anderson, best known as the manager of the Swedish band ABBA, with a donation to the Royal Swedish Academy of Music. Victoria looks just beautiful and Daniel so handsome. Victoria and her sister in law sophie looks stunning. but i wonder why madleine wears such unflattering clothes. she can do it much better. Wow, Victoria! And I also like Sofia (and her handsome husband, of course). Victoria looks lovely, her hair and her red dress are beautiful, I like that is a solid red color and not one of her awful prints. She looks young and fresh. Sofia also looks great modern and elegant. I don't care for Madeleine's outfit at all, she looks dowdy too covered up and the sleeves are bulky. This time Victoria and Sofia look much better. Sofia looks fabulous. And Victoria is a close second, first outfit with a wow-factor from her in a long time. I wish the skirt had a bit more volume but it looks good as it is. Madeleine´s dress is too much hippie-like for me. And I´m afraid she´s not the elf-type that look good in this kind of floaty thing. She looks wide instead. And I wish that Victoria and Madeleine had swapped their flower bouquets for better colour coordination. Daniel looks great. It´s almost as if his hair has some volume. They have no control over the flowers. Sofia, OMG! But all the other look good as well. Victoria looks like a Grecian goddess! Sofia looks fine, just unremarkable. Madeleine is wearing the wrong dress for this event, she is not at a garden party. I personally am getting tired of the flower print dress trend. 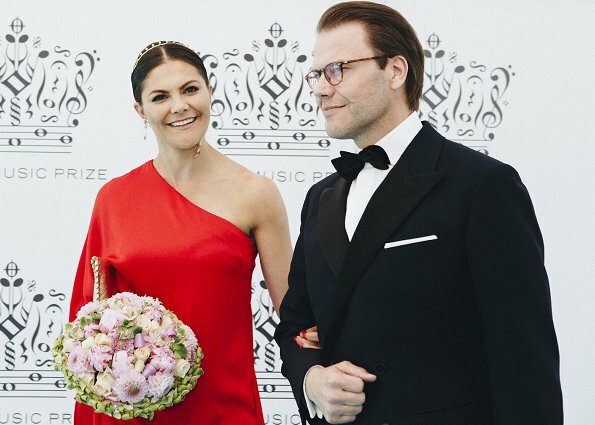 Sofias dress is a bit 'simple' in my eyes, but nice. Agree. Still, they all look beautiful and radiant. Victoria was the best for me. Lovely outfit but that thing in her hair needed to go. Sofia looks great but I feel the dress does not flatter her in the chest. She looks 'flat chested'. Madeleine.... no. Just no. The dress doesn't do anything for her. Maybe with different colors. Silvia.... no. I didn't care for the outfit. For me Sofia looks the best! Green really suits her and the style of the dress looks amazing on her. Even though I hate Madeleine's dress she is still beautiful, her hair is just simply wonderful.😍 I like Victoria's dress but not her hair. The sad thing is that I think she wanted to do something different with her hair and it turned out to be worse than her usual hairtyle. Silvia is elegant and beautiful as always. Well here we have the best of the best.Everyone is outstanding,only Madeleins dress is a miss today,but this is not a big thing, usually she hit a 9 or 10. The Crown Princess WOW!!!!!!!!!!! Sophia H NO. Hair is awful. She looks like a model on a runway. Along way to go before she attains "regal/royal" status. 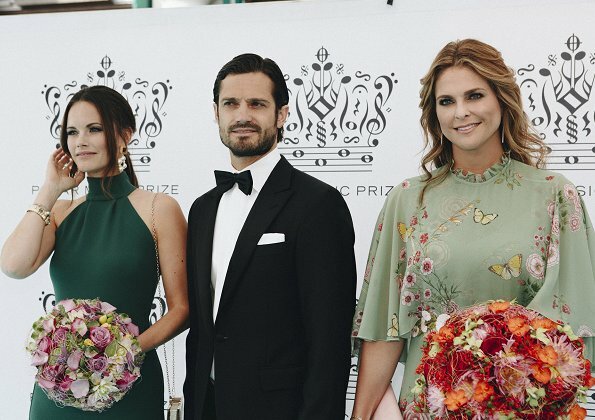 Princess Madeleine is very beautiful, however her dress, although beautiful, this time around is not up to her usual standards. Prefer hers to S's. Wow!!!! All the ladies look magnificent, especially CP Victoria! Am I the only one to dislike Victoria's dress? It looks like two pieces of fabric draped on her. WOW. Just, WOW Victoria. Stunning! I love the Grecian styling of her hair and jewels to go with this gorgeous dress. Victoria looks like Greek goddess, very beautiful up-doe. Love also Sofia´s well cut becoming color gown. About Madeline; I actually like the dress but not here, it talks so different language than others and would have been much better hair up. Now it look like she is taking part to different event at beach. Silvia´s clothes have nothing wrong but they are meh. Agree. that's what I think. Madeleine'dress isn't a gala dress.I like It but not for this event. 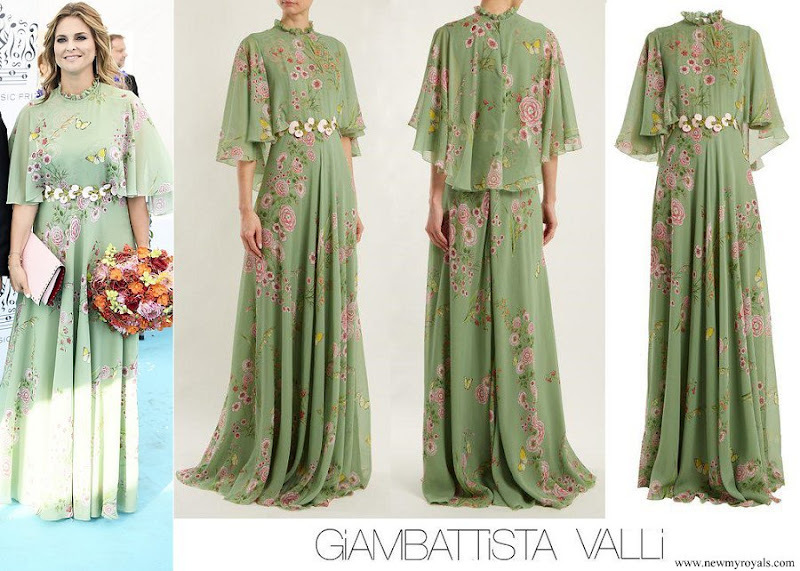 It's another Giambattista Valli dress, the designer of the christening dress she wore just one week ago. Victoria looks fabulous- read really suits her, love the draping. Her hair looks fine to me. Sofia also looks lovely - I like the simple lines of the green dress. Madeleine looks fine but the style is quite different from the others. The Queen looks fine but nothing amazing, just smart. 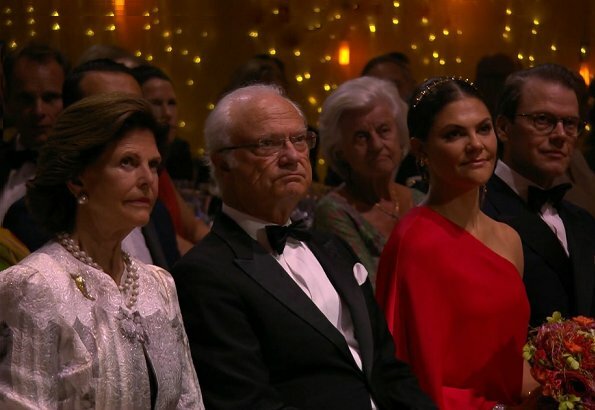 For me the best are Sofia and Queen Silvia. The red dress of CP Victoria is not bad and it suits her well but sorry, I don't like it. Hairdo ist fine. Madeleine can do better, don't like the lash curls in her hair. Sofias dress makes her eyes shine, green ist wonderful for her complexion. Hair is simple but beautiful for her face. Victoria looks absolutely great. And I like those dresses for Sofia, because they bring out her petite figure. Madeleine rarely hits my taste. 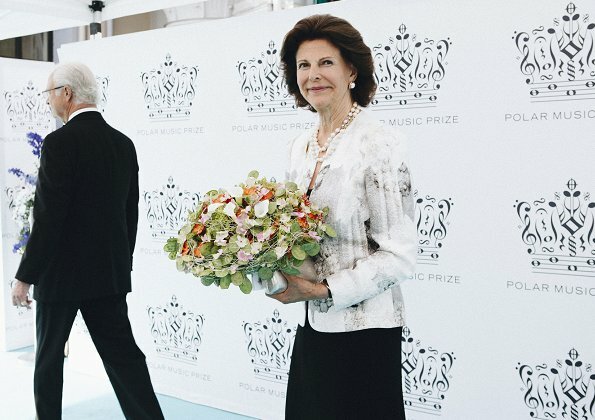 Queen Silvia has a fantastic for her age and looks great too. Victoria looks elegant - such a great change from the frumpy florals. Sofia also is elegant in a style and colour that flatters her. Madeleine - awful. Too voluminous, too fussy, too floral, too much like upholstery fabric. I've thought that for quite some time, too.The king rarely smiles but is dead-pan most of the time. I wonder what it takes to make him jolly! A breathtaking gown on Victoria -- so flattering! The shoes, however, are imo very UNflattering and look more like casual daywear than eveningwear. 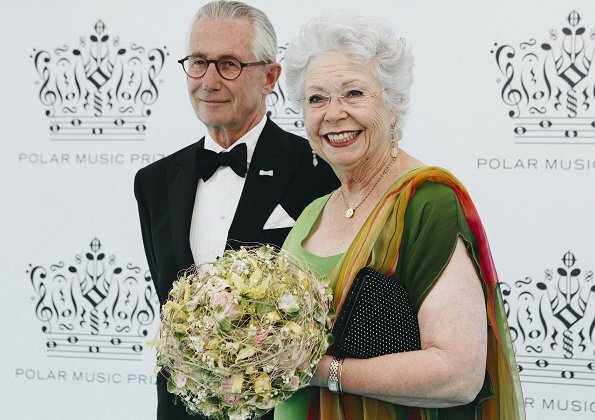 I love Madeleine, not not her choice of a dress for this annual Polar Music Prize celebration. Those frills around the neckline are not flattering, old fashioned and outright dowdy. 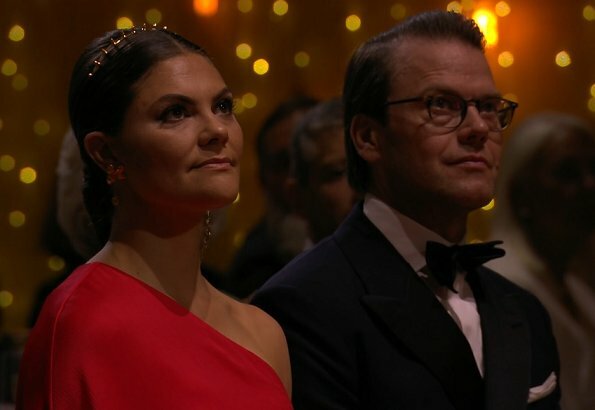 I am glad I am not the only one who thinks Queen Silvia looks best. None of the princesses look bad, however neither of them got it quite right. 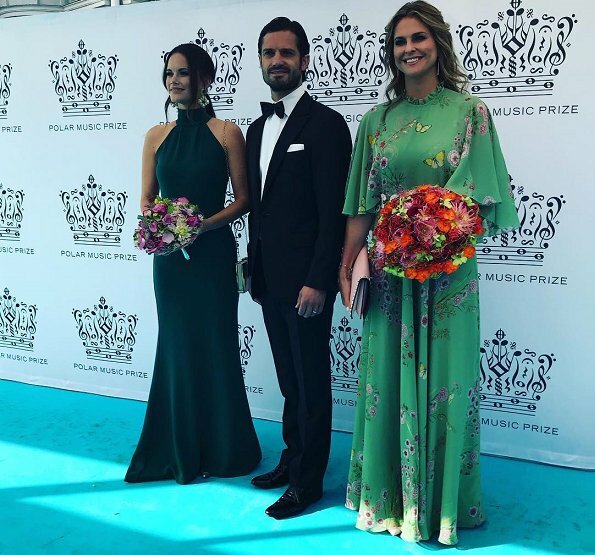 I particularly don’t like Sophia’s earrings with the high neck dress and also the dark green isn’t what I would call a summer shade. Victoria looks good in red, but this weird half-and-half dress isn’t doing her any favours. Madeleine is probably still working on her post pregnancy style. I love the dresses. Queen is chic and...herself. But the event was "florals galore". Majority of the ladies in the audiences wore florals. Princess Christina's outfit was awesome. A mid length silk tunic in shades of green, dark green pants, a long silk scarf in colors of a summer maddow over her left shoulder...she looked splendid! Wish we could have the photo here...pretty please. Thank you for the photos! :-) Here is an interesting link to "Why Polar Music Awards". Just for fun if you have time to read it : https://scandinaviantraveler.com/en/lifestyle/the-story-of-the-polar-music-prize Thank you for Princess Christina's photos again!! !